be super heroes like batman and spider man with capes and special powers. Always catching the bad guys. I'm sure everyone has those kinds of memories from when they where little, you have probably watched your children use their imagination and do the same thing. Those are great memories to have so when I seen this image I knew it would be a great card to honor those memories. and rather than a birthday card I decided to do a just for you card. 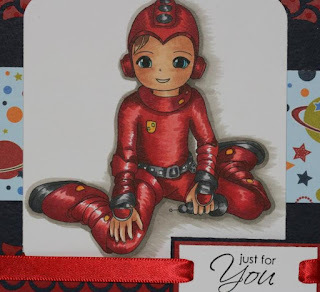 The sentiment is from the friendship ticket sentiments from Whimsy stamps. The image is a digital image from Whimsy stamps as well called Super Hero boy 1 from the designer Scrapper's Delights. You should jump over to the Whimsy challenge blog to check out the wonderful creations made by the Whimsy digital team and enter the challenge this month for a chance to win some great digital images. I had so much fun coloring this image with all the areas to shade to get depth on the image. I don't make very many boy cards so this was a great opportunity to do so. Here is my Super Hero card. Supplies: Whimsy digital image & friendship ticket sentiments, Bo Bunny patterned paper, Martha Stewart corner and matching border punch, Bazzill cardstock, Copic markers and Offray ribbon. wow, your coloring is fabulous Charlene, beautiful card! !